The Special Administrative Region (SAR) of China and former Portugese colony of Macau is a popular excursion destination for visitors to Hong Kong. Macau is quickly and easily reached from Hong Kong by frequent fast ferry services and, for the more time conscious and affluent, by helicopter. A new land crossing via the Hong Kong - Zhuhai - Macau mega bridge opens on 24th October 2018*. However, plans to revive a scheduled seaplane service, last seen during the 1950's, from 2014 failed to reach fruition. Visitors of nearly all nationalities can enjoy a visa-free stay of between 30 and 90 days. For most nationalities which are not elegible for visa-free stay, a visa-on-arrival is available subject to fee although from 1st July 2010 elegibility for visa-on-arrival was withdrawn for nationals (other than Hong Kong ID Card holders) of Bangladesh, Nepal, Nigeria, Pakistan, Sri Lanka and Vietnam. Passports are required and must have a validity of at least 30 days from date of entry into Macau. Visitors from Hong Kong to Macau pass through immigration and customs formalities on leaving Hong Kong, entering Macau and vice-versa. Since December 10th 2009, under reciprocal arrangements between the respective governments, residents of Hong Kong and Macau have been able to register to use an automated clearance system allowing them to use e-Channels and avoid the need to complete arrival and departure cards when travelling between the two cities. TUEN MUN FERRY TERMINAL, Tuen Mun Promenade, Tuen Mun, New Territories. New service to began operating 28th January 2016 (see below). TurboJET operate a fleet of jetfoils and catamarans from Hong Kong Macau Ferry Terminal at Shun Tak Centre at Sheung Wan on Hong Kong Island. The terminal lies a short distance west of Central Ferry Piers and is served by Sheung Wan MTR Station. This is the busiest and most popular route with departures every 15 minutes from 07-00 to midnight increasing to every 5 minutes at peak times. Between midnight and 07-00 services operate at between 30 and 90 minute intervals. The journey takes approx one hour. Travellers can arrive at the Hong Kong Macau Ferry Terminal, buy tickets and usually be able to travel on one of the next one to three sailings. However at certain times, particularly weekends, public holidays or during special events such as the Macau Grand Prix services demand for tickets can be very high become and it may be preferable to make an advance reservation. Seat allocation is made at the departure gate about ten minutes prior to departure. For every departure there is a standby queue and it is often possible to obtain an earlier departure by joining the standby queue which is close to the seat allocation desk by the departure gate. Economy class cabin is comfortable and will suit most passengers requirements. Snacks and drinks can be purchased on board. 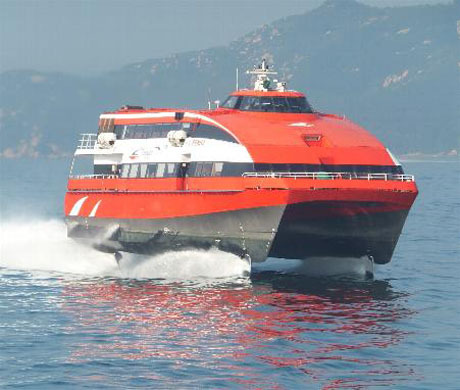 TurboJET also operate a catamaran service from Skypier at Hong Kong International Airport to Macau Maritime Ferry Terminal. This service enables passengers arriving at HKIA to transit to Macau without passing through Hong Kong Immigration, Customs or Baggage Reclaim and similarly allows passengers from Macau to check in at Macau Ferry Terminal to avoid HK Immigration and Customs when transiting via HKIA. The service is only available for transit passengers making air/sea connections through HKIA. Journey time is approximately 70 minutes. Tickets can be obtained from the Ferry Transfer Desk at the airport. 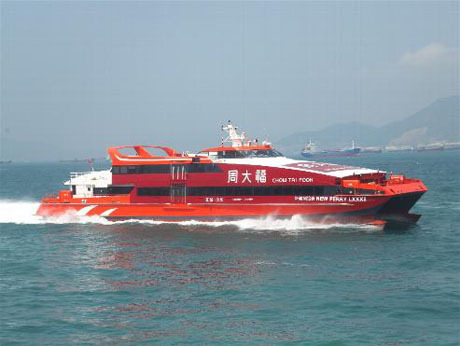 Shun Tak - China Travel Macau Ferries Limited (TurboJET) operate a fleet of catamarans from China Ferry Terminal at Tsim Sha Tsui in Kowloon, under the TurboJET brand. 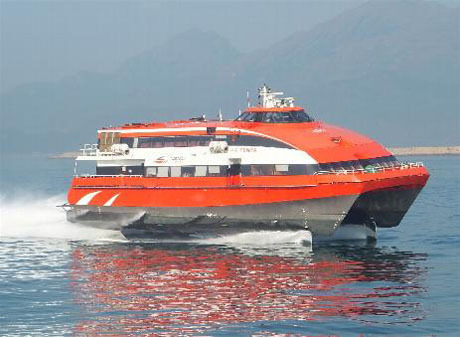 Shun Tak, who also operate TurboJET services from Hong Kong Macau Ferry Terminal and Hong Kong International Airport acquired First Ferry (Macau) and its vessels from New World First Holdings Limited in August 2011. Shun Tak announced that current sailing schedules will be maintained. 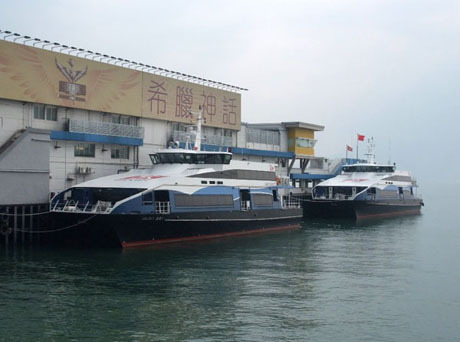 China Ferry Terminal is located at China HK City, Canton Road, just north of Harbour City Shopping Mall. The nearest MTR Station is Tsim Sha Tsui (exit A1) about 10 minutes walk or the terminal can be reached by buses 3C, 14 and 238X. A standard daily schedule operated all year round since January 2009 with sailings from Tsim Sha Tsui and Macau operating at 30 minute intervals from 7am to 10-30pm daily. However, in late 2016 the number of daily sailings was reduced from 32 to 18 and subsequently further reduced to 15 with the service operating at 30/60/90 minute frequency. Journey time is about 60 minutes. TUEN MUN FERRY TERMINAL, TUEN MUN TO MACAU MARITIME FERRY TERMINAL (MACAU OUTER HARBOUR FERRY TERMINAL)** NEW SERVICE COMMENCED 28 JANUARY 2016. Four sailings each way daily, increased to seven sailings each way daily from 1st March 2016. ** with effect from 12th April 2016 the 08-10 sailing from Tuen Mun will operate to Taipa Temporary Ferry Terminal in Macau (and not Macau Outer Harbour Ferry Terminal) and the 16-10 sailing from Macau will operate from Taipa Temporary Ferry Terminal in Macau and not Macau Outer Harbour Ferry Terminal. Cotai Water Jet (previously "Cotaijet") commenced operating services between Hong Kong Macau Ferry Terminal at Sheung Wan and Macau on 1 December 2007 following the opening of the Venetian Resort on the The Cotai Strip in Macau. The service is operated by CKS (Chu Kong Passenger Transport) for Cotai Water Jet Macao, a firm controlled by Las Vegas Sands Corp and Macau company Giant Dragon. The service was suspended from 11 December 2007 after only ten days of operation following court intervention after objections to the tendering process. However on 18th January 2008 the Macau Intermediate Court lifted the interim injunction and the service resumed on Sunday 20th January 2008. On 19th February 2009 Macau's Court of Second Instance ruled the service illegal for the Macau Government to have granted the service to CotaiJet without public tender. Las Vegas Sands appealed against the decision and services continued to operate. 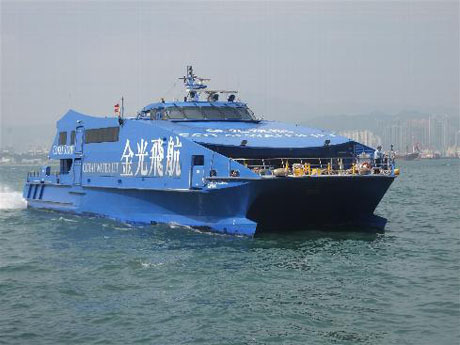 The court ruling resulted from a lawsuit by North West Express who were refused permission to operate a ferry service between Tuen Mun and Macau in 2006 (but were subsequently awarded a licence and commenced operating in April 2011). In January 2010 CotaiJet were finally awarded a 10-year licence by the Macau SAR Government allowing the company to operate the existing route and additional routes to China Ferry Terminal, Kowloon and Hong Kong International Airport Skypier with services on these routes commencing in February 2010 and July 2010 respectively. Services operate from Hong Kong from 06-30 until 23-59 and from Macau from 07-00 to 03-00 at intervals of mainly 30 minutes during the daytime and mainly 30/60 mins at night. and then at 30/60 minute intervals until11-59pm. Journey time is approximately one hour with a free 5 minute coach connection to and from The Venetian from Taipa Temporary Ferry Terminal. Economy fares were revised on 11th December 2017 and from Hong Kong are HK$171 on weekdays , HK$186 on weekends and public holidays and HK$211 for night sailings. Fares from Macau to Hong Kong are MOP160 weekdays, MOP175 weekends and public holidays and MOP200 night*. *night fares apply to sailings from 17-10 from 1st October to 31st January, from 17-40 1st February to 31st March and 1st to 30th September and from 1st April to 31st August. There are six* daytime sailings from Hong Kong on this route, between 8am and 1-30pm, with only one return journey from Macau at 5pm. Economy fare from Hong Kong is HK$171 on weekdays and HK$186 on weekends and public holidays. From Macau fare is MOP160 on weekdays and MOP175 on weekends and public holidays. For Night Sailings (from 17-10 from 1st October to 31st January, from 17-40 1st February to 31st March and 1st to 30th September and from 1st April to 31st August) fare HK$211 from Hong Kong. MOP200 from Macau. Journey time about one hour. *SERVICE SUSPENDED INDEFINITELY WITH EFFECT FROM JULY 2012. TUEN MUN FERRY PIER REPOSSESSED BY THE HONG KONG GOVERNMENT FROM 10th SEPTEMBER 2012. Hong Kong North West Express (HKNWE) were awarded the operating licence for services between Tuen Mun Ferry Terminal in the northwest New Territories and Macau Maritime Ferry Terminal (also known as Macau Outer Harbour Ferry Terminal) in early 2011 and services commenced on 15th April 2011. 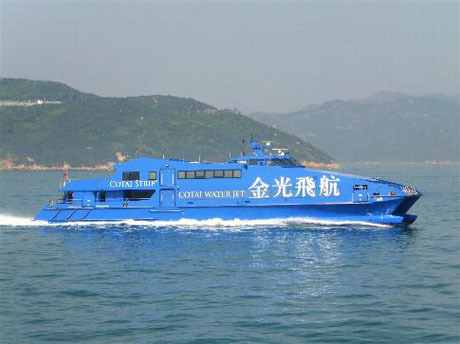 The company, which has previously operated a single daily service to Shekou from Tuen Mun, had been seeking a licence from the Macau Government to operate services to Macau since 2003 and were last denied permission in 2006. 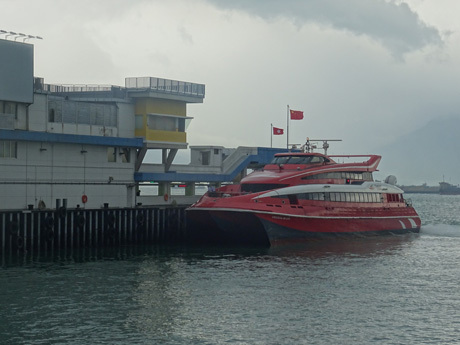 In July 2012 services were indefinitely suspended with reports that HKNWE owed HK$4.7 million in unpaid rent for Tuen Mun Ferry Pier to the Hong Kong Government. In September 2012 it was confirmed that the service would not resume and the government was taking repossession of the ferry pier from 10th September 2012. Tuen Mun Ferry Terminal is located at 148 Wu Chui Road, Tuen Mun. It is served by MTR "Ferry Pier Terminus" Light Rail Station. Passengers travelling on MTR West Rail can interchange to Light Rail at Yuen Long Terminus, Tin Shui Wai, Siu Hong and Tuen Mun West Rail Stations. Macao Dragon, a subsidiary of Giant Dragon Sea Transportation Company, commenced operations on 10th July 2010, but ceased operations on 15th September 2011. The company, which operated four daily sailings each way using 1200-seat fast catamarans, claimed it was unable to operate a viable business owing to restrictions on passenger quotas. The Macau Government initially issued a licence for vessels to carry a maximum of 1,152 passengers but this was later limited by the Macau Maritime Administration to maximum of 750 passengers on sailings from Hong Kong and 600 for the return journey from Macau. Macao Dragon substantially undercut its competitors, offering one-way fares from HK$88. 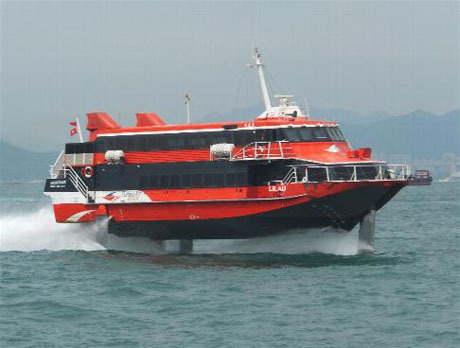 The service had utilised two large 1200 seat multi-deck fast catamaran ferries originally built for a Spanish operator who was unable to take delivery, and operated the same route as the CotaiJet service from HK Macau Ferry Terminal on Hong Kong Island to Pac On Temporary Pier on the Cotai Strip in Macau. 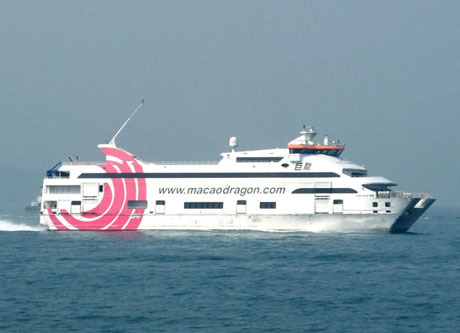 Macao Dragon's two ferries, Shen Long and Tian Long, were seized in September 2011 by lawyers acting for Bank of China and remained moored in Victoria Harbour until being sold, in March 2012, for HK$80 million each to an unnamed Chinese mainland buyer. It is believed the vessels are to be based on Hainan Island. PUBLIC TRANSPORT SERVING THE PASSENGER CLEARANCE BUILDING OF THE HONG KONG PORT OF THE HONG KONG - ZHUHAI - MACAU BRIDGE (HZMB). EFFECTIVE FROM 24th OCTOBER 2018. B4 - Operator - New Lantao Bus Co (1973) Ltd - Circular service HZMB Hong Kong Port - HK International Airport Terminals 1 & 2 - Regal Airport Hotel - AsiaWorld-Expo - Hong Kong SkyCity Marriott Hotel - HZMB Hong Kong Port Passenger Clearance Building - HZMB Hong Kong Port. 24 hours daily at frequency of 8-15 minutes 05-30 to 00-30 and 30 minutes 00-30 to 05-30. Fare HK$7.5 (special promotional fare HK$6 applies until further notice). * services operate via Disneyland from HKZB Port 07-58 to 11-10 and 19-58 to 22-10 Monday to Friday, 07-50 to 11-10 and 19-50 to 22-15 Saturdays, Sundays and public holidays. From Sunny Bay MTR Station 07-40 to 11-16 and 19-40 to 22-16 Monday to Friday, 07-50 to 11-10 and 19-50 to 22-10 Saturdays, Sundays and public holidays. A35 - Operator - New Lantao Bus Co (1973) Ltd (to/from Mui Wo via Tung Chung, Tong Fuk, Cheung Sha and Pui O). Daily from Mui Wo at 05-30, 07-25, 17-00, 22-00 and 00-15, from HZMB Port at 06-15, 06-40, 08-15, 18-15, 23-30. Fare HK$15 (HK$25 on Sundays and public holidays). Green Minibus circular route 901 operates 24 hours a day between Tung Chung North and HZMB Port at intervals of 10 - 30 minutes. The route is via AsiaWorld-Expo and the airport catering area and does not pass Tung Chung Station. Adult fare HK$8.4. Hong Kong - Zhuhai - Macao Bridge Shuttle Bus (Guangdong) Co Ltd operate an initial fleet of about 120 shuttle buses (about 20 double-deck and 100 single-deck) between Hong Kong Port and the Boundary Control Facilities at Macau and Zhuhai. The buses operate between, and terminate at, the border control points Passengers must pass through immigration control in order to board buses and also after disembarkation. The service operates 24 hours a day at a frequency of 5 minutes in peak hours, 10 to 15 minutes during non-peak daytime hours and 15-30 minutes overnight. Journey time between Hong Kong Port and Macau Port is about 40 minutes. The adult fare is HK$65 during the daytime and HK$70 at night. Tickets can be bought in advance via the company's website or, on the spot, in the departure hall after immigration. 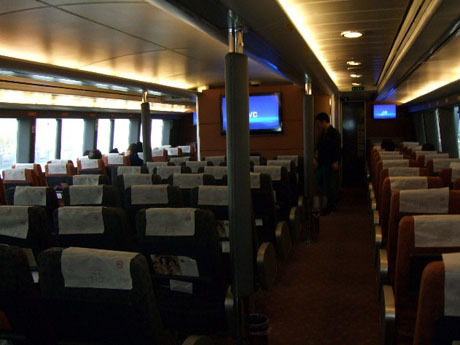 Cross-boundary "point to point" coach services between Hong Kong and Macau are provided by several operators. Passengers need to disembark and reboard coaches at the border control points. Sky Shuttle Helicopters Ltd operate a helicopter shuttle service between Shun Tak Centre at Sheung Wan on Hong Kong Island (Hong Kong Macau Ferry Pier) and the Macau Ferry Terminal using a fleet of six Agusta Westland (AW) 139 helicopters. 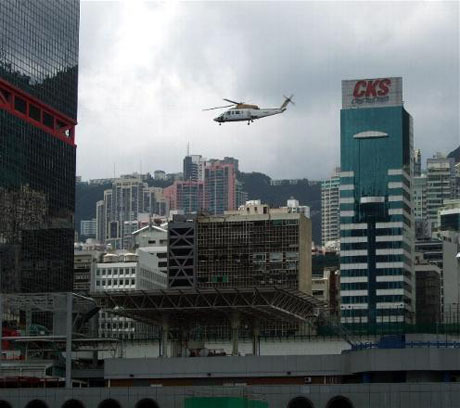 The company installed a second helipad at Hong Kong Macau Ferry Terminal during 2009. Flights operate daily at 30 minute intervals from 9-30 to 22-59 from Hong Kong and 9-00 to 22-30 from Macau. The journey takes 15 minutes. Fares are HK$4300 each way or HK$4800 each way on designated holidays. Most casinos including The Venetian, Sands and MGM Grand operate free shuttle bus services to and from the ferry terminal. Shenzhen-based Waterfront Air was planning to commence operating a scheduled seaplane service in 2014 from a new Kai Tak Waterfront Aerodrome to Pak On Ferry Terminal near the Cotai Strip in Macau. The company, co-founded by Peter de Kantzow, whose father was a co-founder of Cathay Pacific, and Canadian business partner Michael Agopsowicz, arranged a partnership with Shenzhen Airport Authority to provide a hub and maintenance base for the services. The service had the support of the Hong Kong Government's Tourism Commission, as bringing added value to the harbour. Pilots were to be recruited from Canada and Australia and services were also planned to operate between Shenzhen and other Pearl River destinations. As at December 2012, the company was undergoing preliminary licensing approval from the Chinese aviation authorities. The Hong Kong - Macau service was to have utilised a fleet of leased Twin Otter DHC-6 series 300 floatplanes to operate 20 flights daily for the 15/20 minute flight. The planes were to be configured to take 2 pilots and 16 passengers with a luggage allowance of 10kg each. Any excess luggage was to have followed by ferry. The planes were expected to fly at an altitude of about 150-metres to allow passengers to enjoy the views. The company intended to charge a one-way fare of HK$1800. Scheduled seaplane services were previously operated between Hong Kong and Macau by Macau Air Transport Company from the late 1940's until December 1962. Macau Air Transport Company which was founded by Sydney Kantzow and Roy Farrell, co-founders of Cathay Pacific initially used Catalina flying boats and, later, Piaggio PI36 6-seater twin engine aircraft until silting up of the Macau harbour made landing too difficult. Waterfront Air ceased trading in December 2014 without having commenced operating any services.